The publishers have kindly given me permission to adapt the pattern with the proviso that I share the source. 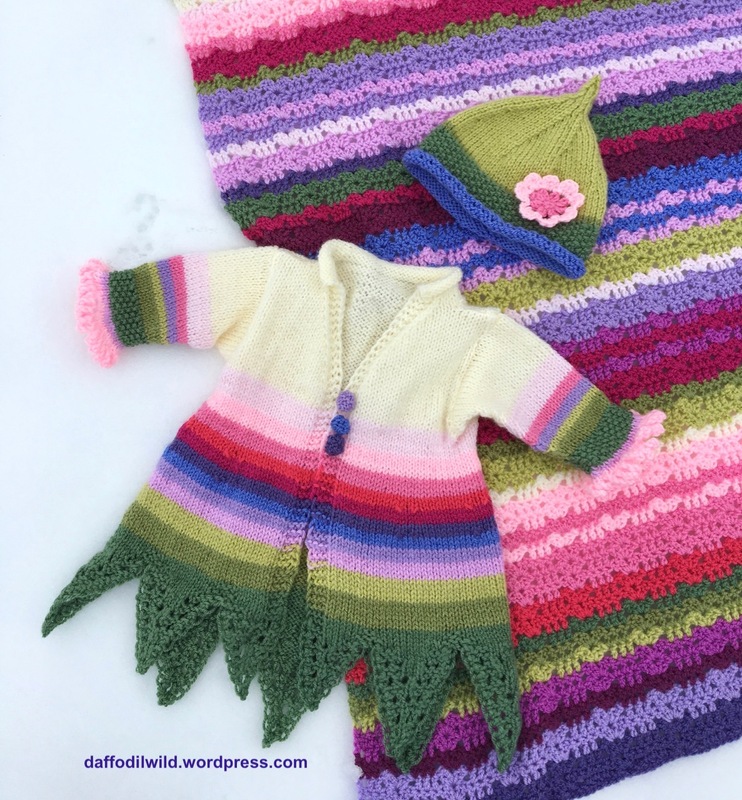 The colours of this version of mine have been inspired by the Sweet Pea Cal colours designed by Lucy of Attic24. I shared the Pixie Point Hat Pattern with you here. There is a pattern for the Jacket for aged 1-2 years old in my Ravelry and Etsy Shops. The pattern is entirely knitted. The pixie points and cuffs are knitted. Gauge: 22st and 29 rows for a 10cm, 4 inch square using Size 8 or 4mm needles in stst. This pattern can be made in all one colour. Cypress, Meadow, Pistachio, Clematis, Wisteria, Bluebell (Lucy uses Lavender) , Violet, Fuchsia Purple, Pomegranate, Blush, Candy Floss, Soft Peach, Cream. Do not break the yarn of the last 11st V Point. Make sure all the points are lined up in order with RSs facing. Row 1: SlP, K to end. Row 3: SlP, K to end. Row 4:SlP, K3, P6, K2, P11, K2, P13, K2, P15, K2, P17, K2, P15, K2, P13, K2, P11, K2, P6, K4. Keeping the selvedge and garter st border on both sides, work 22 rows stst. Next Row: RS in Violet. SlP, K14, K2tog, K1, K2tog tbl, K9, K2tog, K1, K2tog tbl, K11, K2tog, K1, K2tog tbl, K13, K2tog, K1, K2tog tbl, K13, K2tog, K1, K2tog tbl, K11, K2tog, K1, K2tog tbl, K9, K2tog, K1, K2tog tbl, K to end. Working the edges as before work 2 rows stst in Violet. SlP, K13, K2tog, K1, K2tog tbl, K7, K2tog, K1, K2tog tbl, K9, K2tog, K1, K2tog tbl, K11, K2tog, K1, K2tog tbl, K11, K2tog, K1, K2tog tbl , K9, K2tog, K1, K2tog tbl, K7, K2tog, K1, K2tog tbl, K to end. Change to size 10 needles. on the right hand side of the Jacket with RS facing: SlP, K1, yfwd, K2tog, K to end. In the next Row, make another buttonhole. Change to Cream and work in Cream from now on. Cast off 4 sts, K to end. Left Bodice: SlP, K3, P to end. Wind off 14gm of wool from another ball and join wool to the set of 47sts and cont in st.st. Join yarn to Right Front and P to last 4 sts, K to end. Work across all three sections in st st for 5 rows, keeping selvedges and garter st borders. Right Front (RF): SlP, K3, K2togtbl, K to end. Left Front (LF): K to the last 6 sts, K2tog, K4. LF: SlP, K3, P to end. B: P RF: P to last 4 sts, K.
Keeping garter st and selvedges repeat Rows A and B until RF and LF have 17 sts. B: K16, K2togtbl, K1, K2tog, K5, K2togtbl, K1, K2tog, K to end. LF: K to the last 6sts, K2tog, K4. Next Row: as Row A.
LF: Slp, K3, P to end. Fold LF back so that the RS is next to the RS of the back and with a 3 needle cast off, cast off 6 sts. Put remaining 8sts of LF on to a stitch holder (or safety pin). RF: Fold RF so that the RS faces the RS of the Back and with a 3 needle cast off, cast off 6 sts. Put remaining 8 sts of RF on a stitch holder. K across the Back, and then working across the 8 sts from the LF stitch holder, K2, K2tog, K2. Next Row: SlP, K3, P to end of the Back, and work across the 8 sts from the stitch holder: P4, K4. Change to number 10 needles and SlP and K to the end of the row. Cast on 6sts using cable method. * Cast off 4 sts, slip the st. on RH needle onto LH needle, cast on 5 sts* rpt from * to * until you have 28sts on needle. Moss st for 8 rows. Change to size 9 needles and continue in st st.
MK1 st each end of the next and following alt K rows. After 10 rows using No 9 needles, change to size 8 and cont in st st and continue increasing at beg and end of every alternate knit row. For a straight sleeve: Continue in this way in stst and increasing on alt K rows until there are 44 sts. Increase each end of every K row until there are 48 sts. Knit into front and back of each st. 6sts. Next row K into front and back of first st., K3, K into front and back of next st., K1. 8sts. Next row: (K2tog) 3 times. Thread the end of the yarn around the edge of the work and pull thread tight to form a ‘ball’ and fasten off. Leave long thread for securing onto the jacket. I sew in the ends diagonally at the back, they are less obvious that way. Sew the sleeve seams together, making sure the colour stripes match. I like to sew them with the same colour using mattress stitch from the Right Side. Pin the sleeves into the armholes, Right sides together, with the sleeve seam slightly to the back, so that it does not show at the front. Pin and sew using a back stitch. Sew on the buttons opposite the button holes. The Cocheted flower on the Bluebell hat is a pattern Flora Flower designed by Lucy. I do hope you have enjoyed this pattern. Please let me know if you have any difficulties. The pattern has been tested by Tialys, pop across to see her beautifully stylish version made especially for her new great-nephew. Thank you Tialys! Next Row: P1, (yrn, P2 tog) to the end. Starting with a K row, work 6 rows of stst. Continue in stst until work measures 9.5 cm (straighten out st st border to measure) ending with a P row. Next Row: (K7, K2tog) to last 3 sts, K3. Next Row: (K6, K2tog) to last 3 sts, K3. Next Row: (K5, K2tog) to last 3 sts, K3. Next Row: (K4, K2tog) to last 3 sts, K3. Next Row: (K3, K2tog) to last 3 sts, K3. Break yarn and pull through leaving at least 15 cm for sewing up. Sew from the point to the rim in mattress stitch, working on the reverse side for the stst of the curled rim. I am happy for you to sell anything you make using my patterns. It would be great if you could credit me as the designer. Please respect my pattern, it is for your own use. Please do not pass it on to anyone else except by a link to this post – thank you. If you try the pattern I’d love to know how you get on. Feedback most welcome. Would you like a Pixie Point Jacket to go with it?